Product prices and availability are accurate as of 2019-04-11 05:37:58 EDT and are subject to change. Any price and availability information displayed on http://www.amazon.com/ at the time of purchase will apply to the purchase of this product. The M1836BC6C mobile wire basket unit from Quantum Storage is a modular storage system consisting of wire shelving and baskets which can be moved around for maximized efficiency. Unit consists of four posts, three adjustable baskets (including collar hooks), two wire shelves, four donut bumpers and four swivel casters. Baskets allow for high visibility and air circulation. Baskets are adjustable in 1" increments. Posts are 63" high. Casters are made of polyurethane, two of the four include brakes. Load capacity: 110 lbs per basket. 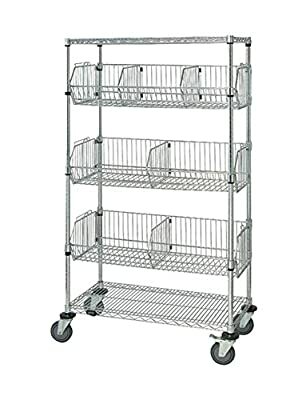 Out dimensions: 18" x 36" x 69" Shelf Dimensions: 18"W x 36"L Chrome finish.